The St. Louis Blues came two points and a few regulation/overtime wins shy of being the Central Division Champions yet again. Although they fell short of their regular season milestone, there are much more important things just around the corner. In their loss to the Washington Capitals, the Blues ended the season second in the division. That pits them against arguably their biggest rival and the defending Stanley Cup Champion Chicago Blackhawks. It might seem as if St. Louis is the underdog, despite their higher seed, but playing the Hawks in round one might be the best thing for the Blues. Last year Chicago’s line-up featured players to the likes of Jonathan Toews, Patrick Kane, Duncan Keith and Corey Crawford exactly how this year’s does. However, this a team that lost some significant competitors from their roster including Patrick Sharp who scored 20 goals and 55 points for the Dallas Stars and Johnny Oduya who also contributed 21 points to Dallas’ season totals. 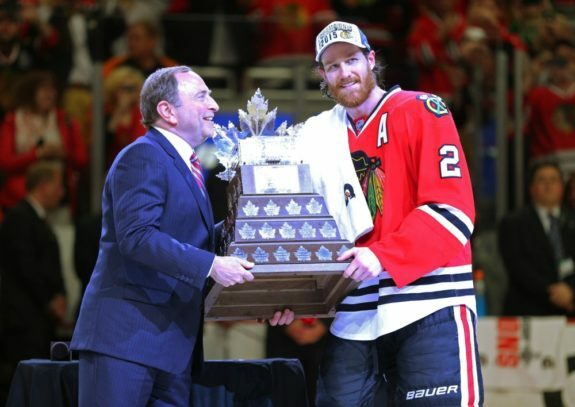 On top of the losses due to salary cap space issues, the Hawks are going to go in game one without number one defenseman Duncan Keith. Their starting goaltender Corey Crawford is coming back from injury and Jonathan Toews ended the regular season not even reaching the top 50 in scoring. That’s certainly reason to think the beast the Blues will face come Wednesday night won’t be anything like season’s past. Although that doesn’t mean the Hawks will be an easy opponent. They still have up and coming players that can make a difference and Keith will be back from suspension for game two. Blues fans, however, have to be optimistic that these Hawks aren’t like the team they faced in 2014. The Blues have an insecurity when it comes to the Blackhawks because they were up by two games in the first round two years ago and Chicago came back with four straight wins to eliminate St. Louis. That’s a memory that is instilled in the Blues players that played in that series and it’s something they’ll certainly remember in the upcoming one. St. Louis has to find a way to overcome their uncertainty about the Hawks in the playoffs and remember that the Blues came out on top this year in the regular season, going (3-2-0) in five games. That’s reason to be optimistic moving forward and it’s motivation to get the final four wins they need to eliminate the defending champs early. If the Blues can come out on top and get through this tough first round opponent, they have a shot at winning it all. Winning this series will undoubtedly boost the locker room’s morale and make them a better team overall. That’s why it’s so important that St. Louis does what they did two years ago and establishes dominance early, only this time they have to maintain it. The Blues are fighting to bring the first Stanley Cup to St. Louis in franchise history. A lot of them are fighting for the first championship win of their careers and it’s something special that they’re in thick of it already. Facing the Hawks will be tough and it will be a physical battle requiring offense, defense and goaltending nothing short of excellent, but if they can do it, the Blues will legitimize themselves in the playoffs. They will prove to the league their abilities and they just might come home with the ultimate prize.